If Yemen conjures any images in your imagination they probably aren’t scenes of amazing beaches or abundant biodiversity. Yet that’s exactly what you’ll find on the Yemeni island of Socotra, one of four members of an archipelago of the same name 400 km (250 miles) off the Arabian Peninsula. 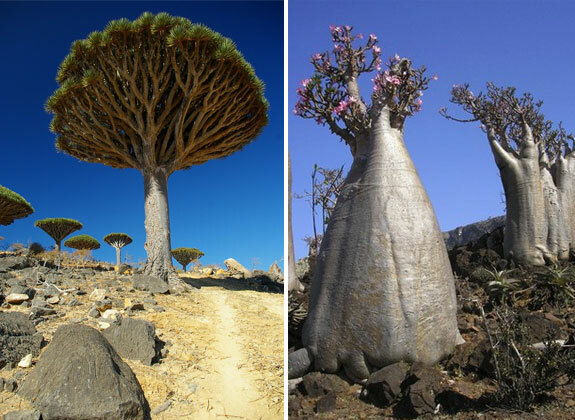 Socotra has been a world unto itself for more than 300 million years. Even back then, when the continents were joined together in a single landmass, Socotra was still an island. As a result Socotra today has more than 800 plant and 700 animal species found nowhere else on earth—only Hawaii and the Galapagos Islands have more. 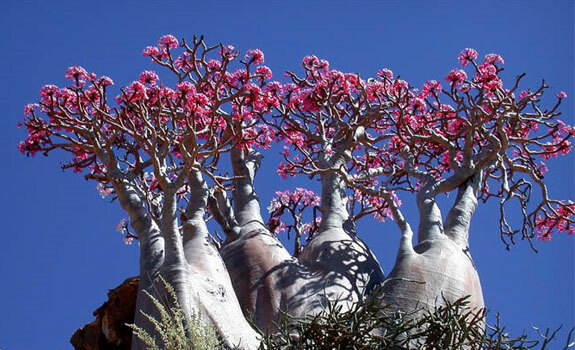 The most striking of the species native to Socotra is the dragon’s blood tree and it’s distinct umbrella shaped top. 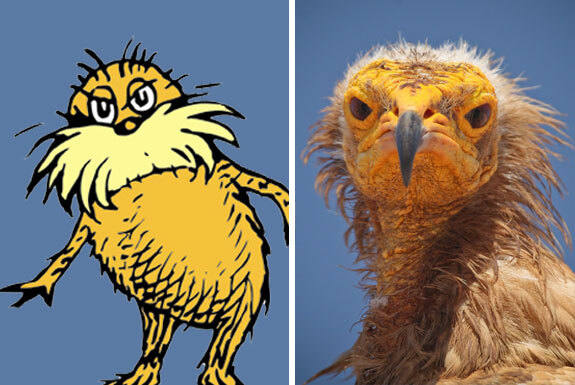 Also very Seussian in appearant is the Socotra vulture, which looks a little like the Lorax (see the photo above). 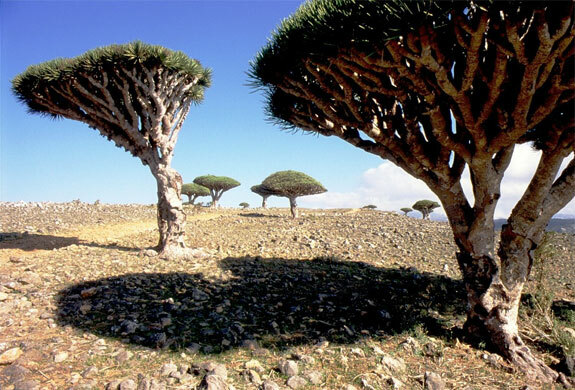 Travel to Socotra became a lot easier in 1999 with the completion of a year-round airport. Since then the island has received a steady trickle of tourists. If you visit bring plenty of sunscreen but don’t bother with a phrasebook—Soqotri, the language spoken by the Socotra’s 50,000 inhabitants, is unwritten. Question: What’s the oldest living or man-made object in the United States east of the Rocky Mountains? 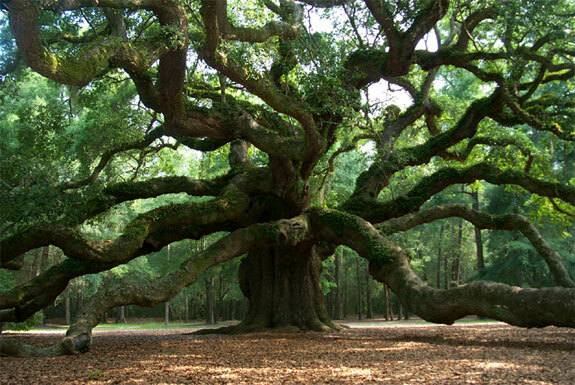 Answer: The namesake tree in Angel Oak Park on Johns Island near Charleston, South Carolina. The 1,500+ year old tree is 65 feet (20 meters) tall and over 25 feet (7.5 meters) around. The amazing collections of limbs protruding from the tree look like something directly out of a Dr. Seuss book. Taken together these limbs provide shade over a 17,000 square foot (1,500 sq m) area, or an area larger than three tennis courts! The Angel Oak Park is open from 9am to 5pm daily. Check out the park’s website for more photos and info. Where To Stay: Planters Inn for grand southern charm or the cool Not So Hostel for a cheap sleep. The Salar de Uyuni, in southwestern Bolivia, is easily world’s largest salt flat—the perfect places for a North-Going Zax to meet his South-Going counterpart (watch video here). 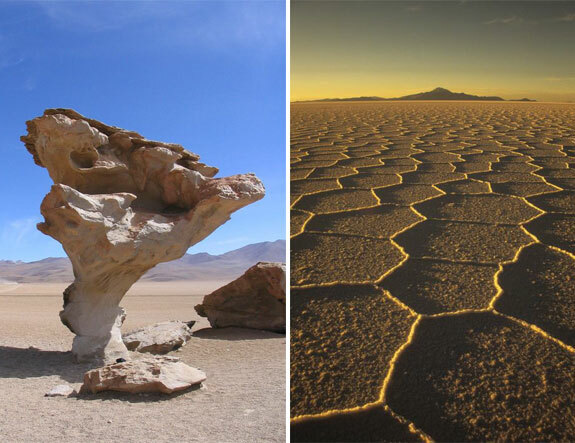 The region around Uyuni also provides one of the most surreal landscapes on the planet. 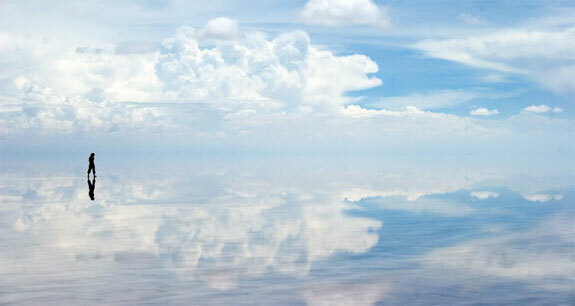 When the flats are wet the Salar de Uyuni acts as the world’s largest mirror. On the edges of the flats are Seussian-shaped cacti and rock formations. In prehistoric times the Salar de Uyuni was a massive brackish lake. When the lake dried up 40,000 years ago it left an estimated 10 billion tons (!) of salt behind. Thousands of tons of these salts are extracted for sale every year. 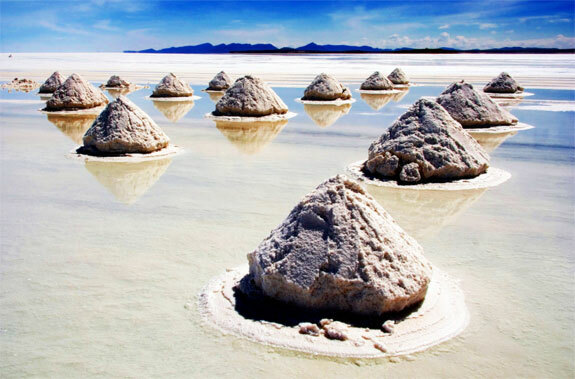 In one step of the harvesting process the salt is piled into conical piles (see photo, below) that themselves look like something from a Dr. Seuss book. 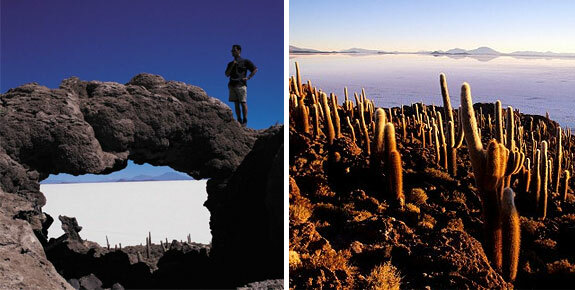 The uses for the Salar de Uyuni region is today as surreal as its landscape. In addition to tourism and salt mining the area is a prime breeding ground for South American flamingos and is used by orbiting satellites to calibrate their remote sensing instruments. Where to stay: Hotel de Sal Playa. The Salt Hotel! 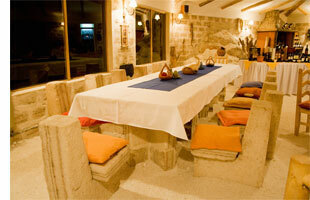 The walls, floor and even the furniture of this 15-bedroom establishment are constructed entirely of salt. (Photo to the right). The hotel also has a comfortable lounge, bar and restaurant. Need a litting seasoning on your dinner? Just chip a bit off of your table. Guests are, however, asked to refrain from licking the hotel’s walls. 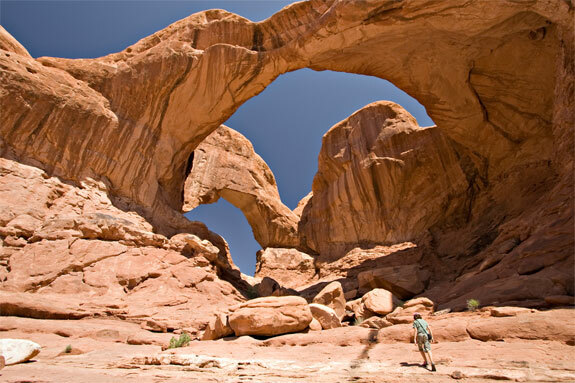 We don’t know for certain if Dr. Seuss ever visited Arches National Park. But looking at his illustrations we have to imagine that he at least saw photos of this section of Utah where the rock contorts into arches, dramatic cliff edges and long narrow pathways above the ground. The park has over 2,000 sandstone arches along with a variety of oddly balanced rocks and a few cliff top caves of the sort where the Grinch might live. Visit in the fall or spring when the weather is most pleasant for hiking. Where to stay: Moab, UT has a mostly unimpressive collection of cheap chain hotels. The Sorrel River Ranch Resort is by far the most scenic option. Stay there or in one of the town’s three B&Bs. Who would have thought that the world’s most Dr. Seuss-like hotel would be in Vietnam? 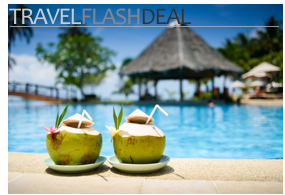 Or that there would be two short degrees of separation between this hotel and the Communist revolutionary leader Ho Chi Minh? 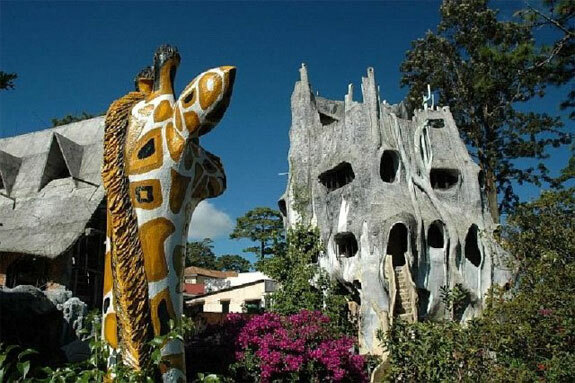 Yet the Hang Nga Guesthouse in the south-central Vietnamese city of Dalat, looks exactly like the sort of place you would expect to find the Cat In The Hat. This hotel, built by the daughter of a former President of Vietnam and Ho Chi Minh confidant, is so quirky that locals have come to refer to it as “the crazy house.” On the Hang Nga grounds visitors can lounge in cave sitting rooms next to giant spider webs made of wire. And that giant concrete giraffe? That’s the hotel’s tea room. Finding your hotel room is an adventure at Hang Nga. The accommodations are scattered among various buildings, some connected by rickety bridges. In each building are a maze of rounded hallways and stairways with no steps of the same size. Once—or, rather, if—you locate your room may find your bed in a mini-cave or a private reading desk up a ladder in a nook; there might or might not be mirrors on the ceiling, a staircase made of tree stumps or large paper mache ants crawling the walls. Room rates range from about $30 to $70—it is worth paying for the more expensive rooms. You can also tour around Hang Nga during the day for a mere $0.50. The hotel grounds are a popular tourist attraction with foreigners and Vietnamese alike. Spot Cool Stuff loves a good treehouse hotel. 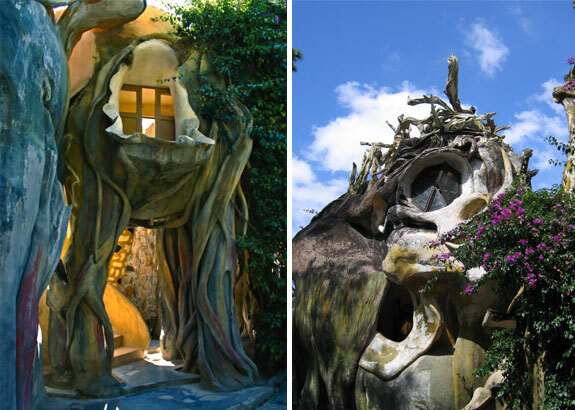 And if that treehouse hotel looks like it could be designed by Dr. Seuss then, well, what could be better? Scattered around the jungles of Kerala, a state in the south of India, are several such Seussian treehouses. One of our favorites is the Green Magic Resort. There the treehouse abodes are truly high up in the canopy. One of the treehouses is 27 meters (90 feet) above the ground and accessible only by a rope bridge. 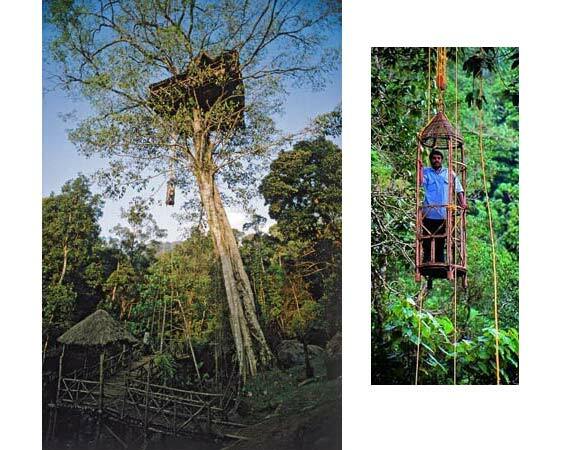 Another is 30 meters high—to get there guests must be hoisted up in a wooden pod (see photo, below)! Those with vertigo may want to stick to one of the treehouses accessible by a narrow wooden staircase that wraps around the trunk of the tree. Green Magic is a true eco-resort. Each treehouse was constructed by Paniya tribesmen entirely with local materials, using indigenous building techniques. All of the resort’s electricity is produced on-site through alternative means. At a nightly rate ranging from $120 to $240, the Green Magic is among the world’s most expensive resorts not to offer hot showers. But then staying clean is a secondary consideration when staying at a treehouse hotel this wonderful. Scattered around the rural areas of Tunisia—which is to say, around most of Tunisia—travelers will find ksars, local Berber villages. The berbers are an ethnic group, 40 million strong, spread across the north of the African continent from Egypt to Morocco. Their ancient building methods are still very much in use today. Berber construction methods involve the molding of sand and rock; nails and planks are almost never used. The resulting architecture looks like a cross between the casaba in Star Wars and a Dr. Seuss house. For an example of a construction at the casaba end of the Berber architectural spectrum check out our review of the Adrere Amellal in Egypt. But for the Dr. Seuss side of Berber building there’s no place better than Tunisia. 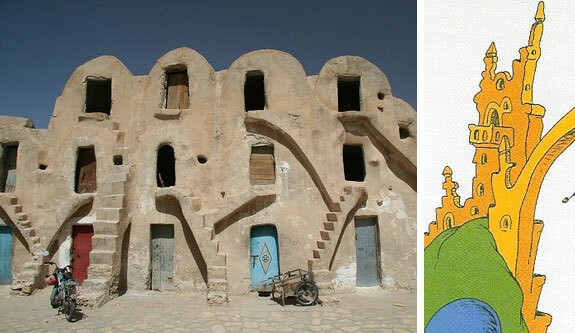 Many of the berber houses here have the same rounded-top windows and arches on the exterior of a building (see photo below) used in many of Seuss’s illustrations. Zeraoua is one of our favorite ksars. To explore around, however, it helps greatly to connect with a local travel expert. Sam I Am would not like his green eggs and ham eating slow, or with his toe, or ordered to-go. But he might like them at Casa Batlló. This building is one of several around Barcelona designed by Antoni Gaudí. 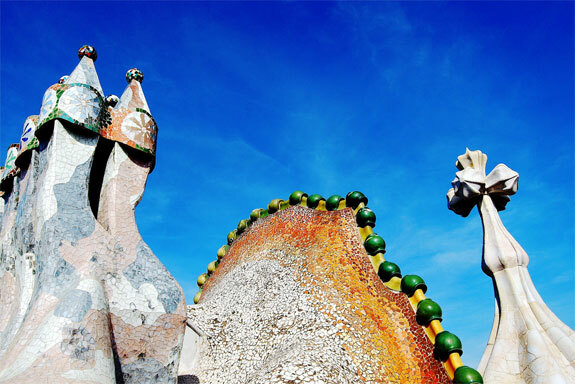 Like Dr. Seuss, Gaudí almost never used straight lines in his constructions. 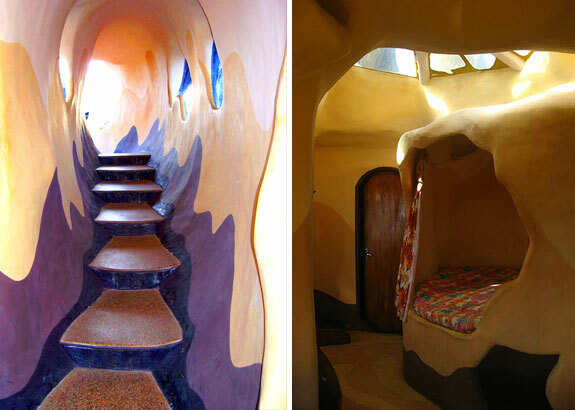 The Casa Batlló is, arguably, his most Seussian work. 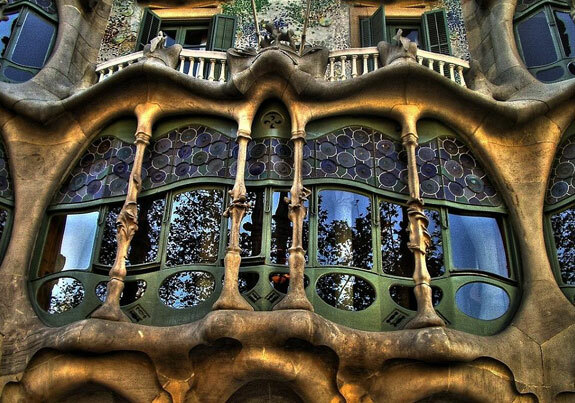 (Although, to be fair, it should be pointed out that the Casa Batlló was completed in 1877, exactly 50 years before Seuss published his first book). There’s something about this building that feels organic; to walk around inside it is to feel like one’s walking around the innards of some living creature. Indeed, locals refer to this building as the casa dels ossos (the house of bones). 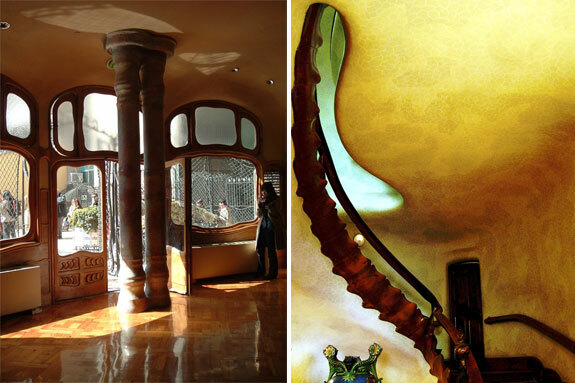 Today the Casa Batlló is a popular museum. If you visit save yourself some time standing in line and order your tickets online through the museum’s website. Where To Stay: The Grand Hotel Central is a superb central hotel (with a cool rooftop pool). 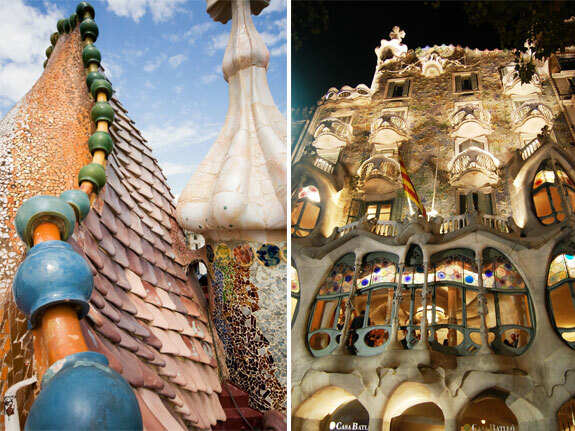 Among the less expensive options we like the Barcelona Dream—or click here for other options. 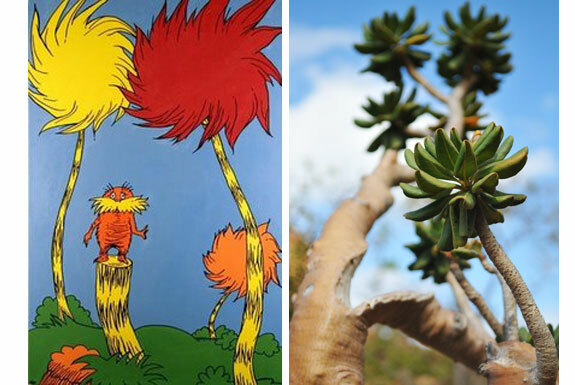 Finally, A Few Seuss-Themed Sites . . . 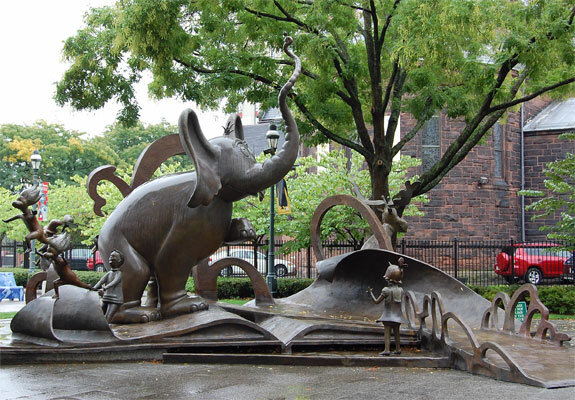 Located in Seuss’s hometown, the Seuss National Memorial Sculpture Garden has bronze versions of several popular Seuss characters including a 14-foot (4-meter) tall Horton the Elephant. 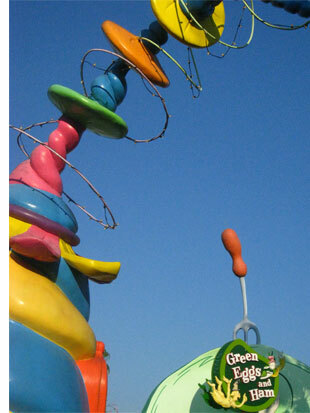 The sculpture garden is small but Seuss fans traveling in Western Massachusetts will likely find it a nice little stop. 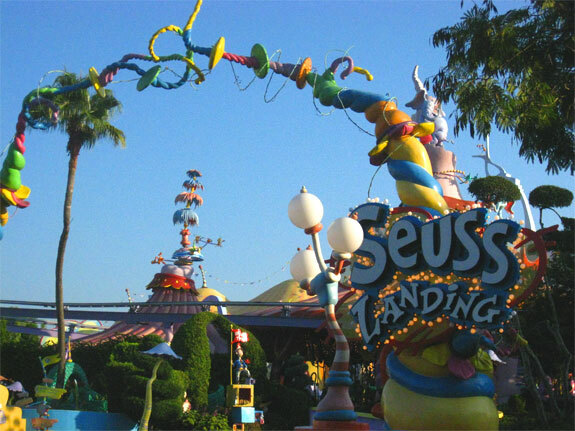 At Universal Orlando’s Islands of Adventure, Dr. Seuss has inspired a theme park within a theme park. Seuss Landing is clearly, and understandably, geared towards younger kids (3~7 year olds). But even stodgy adults can enjoy the Seussian water slide. 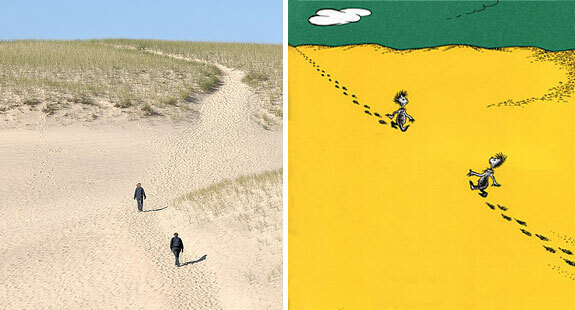 And conniseurs of the surreal can appreciate the Caro-Seuss-el. Note: The “wacky” music played on an endlessly repeating loop through Seuss Landing will eventually cause even the most gentle-tempered adults to punch The Cat In The Hat square in the mouth—please time the length of your stay accordingly. 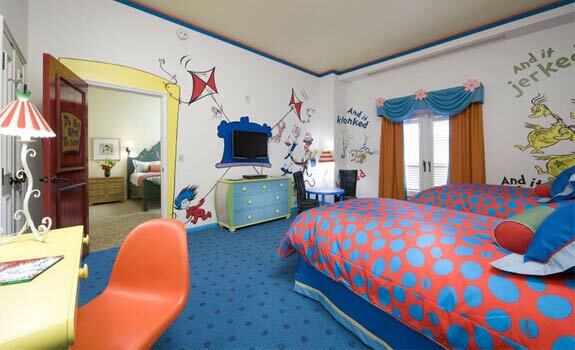 Where to stay: Why the Dr. Seuss Suite at the Loews Portofino Bay Hotel of course! The suite (photo below) has both a kids bedroom and an adult one, each with their own flatscreen TVs and yellow and orange Seuss-themed furniture. All guests at the Portofino Bay Hotel—as well as the Hard Rock Orlando and the Loews Royal Pacific Resort—get access to Islands of Adventure an hour before the general public plus complimentary access to the express lines. That alone makes it well worth choosing one of those three properties. Some very clever comparisons with Dr Seuss! Loved the pictures of Socotra. What an inspiring post! I’ve loved Dr. Seuss since I was a young girl and this combines my admiration for his worldly vision and new darts on the travel itinerary map. Thank you! Oh my god, these are so cool! How fun! Thanks, Juan. Much appreciated. We hope you return often. Absolutely great pictures! Now I’d like to take a plane and visit those places. The only one I’ve seen so far is Casa Batllo in Barcelona. Did you notice the similarity with the Vietnamese cave house? THIS is such a cool article! i love it! great work putting together these photos and descriptions – i want to go to many of them! What a great article. I live relatively close to the Angel Oak’s in Charleston, will have to go visit.